The incidence of vascular anomalies is rare, and they are mainly localized in the head or upper extremity. We report the case of an 8 year-old boy with arteriovenous high-flow malformation of the foot. Presentations of diagnostic and therapeutic opportunities as well as post surgical clinical follow-up are included. Key words: Arteriovenous malformation, angiography, foot, children. We report the case of an 8 year-old boy who presented in 2008 with a one-year history of progressive left foot pain and local swelling without previous trauma. Weight-bearing activities exacerbated the pain. On clinical examination, a plantar soft tissue swelling with local paraesthesia and hypersensitivity was seen. The left foot was held in a relieving pes equinus posture. 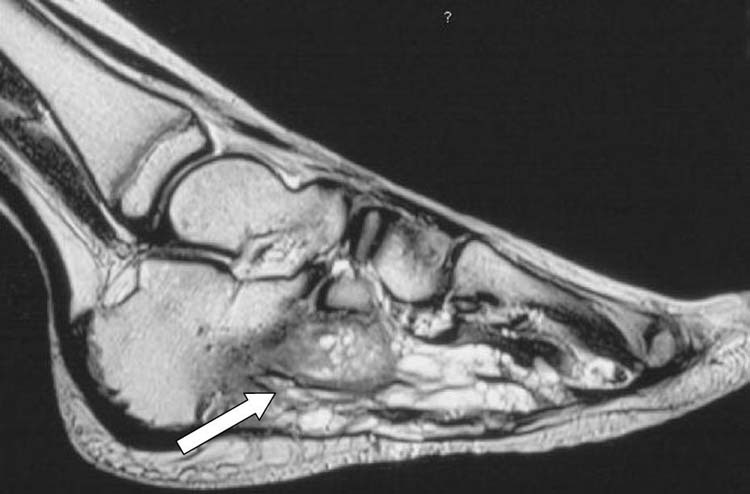 Figure 1 Sagittal MRI of the left foot with hypervascularized tumor on T2 (arrow). 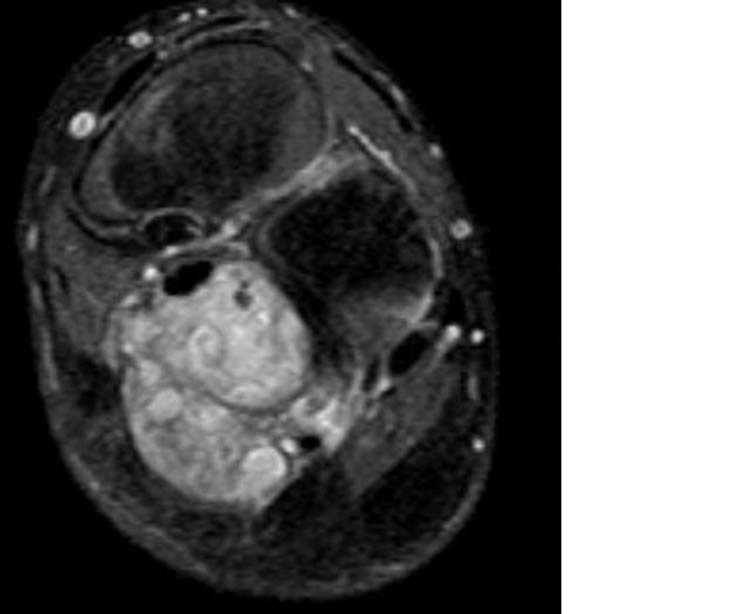 Figure 2 MR image of the left foot with hypervascularized tumor on T1. Figure 3 Percutaneous puncture and illustration of the malformation by injection of contrast medium. Additionally in projection of the third toe a high-flow arteriovenous malformation was depicted supplied in an en-passant fashion by an interdigital artery and arteries to the back of the foot. (Fig. 4) Due to these arterial collaterals a percutaneous embolisation was not performed because of the risk of necrosis of the toe. Figure 4 Percutaneous puncture and illustration of the malformation by injection of contrast medium. 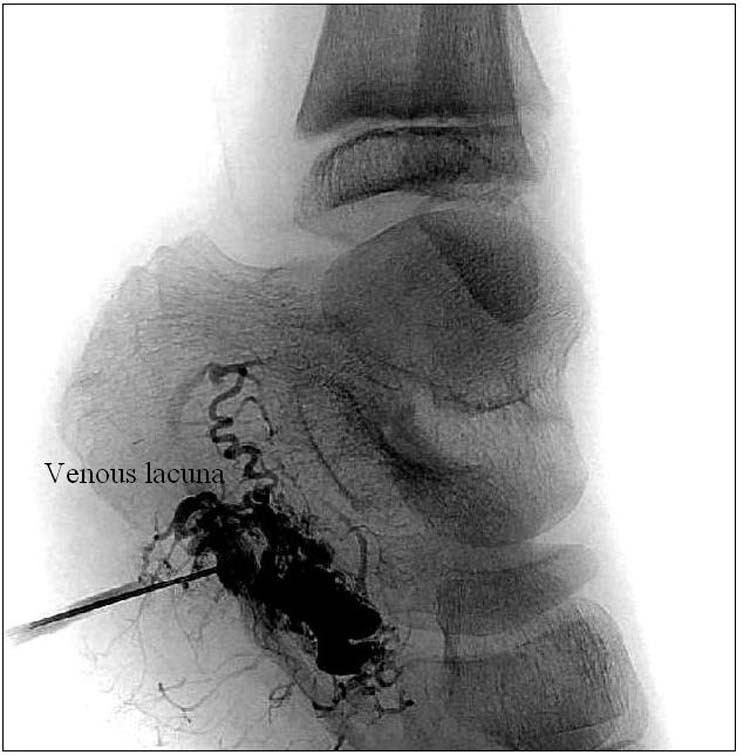 During the course of further treatment planning MR angiography was performed and revealed a hypertrophy of the posterior tibial artery and of the lateral part of the plantar artery. The distal part of Ramus profundus of A. plantaris medialis was the focus of the malformation after its passage through the abductor hallucis. Expected circulatory disturbance of the third toe and the probability of an incomplete occlusion of the malformation using transarterial embolisation limited the therapeutic options. Finally, marginal surgical resection of the malformation was performed. Histological examination confirmed the diagnosis of arteriovenous malformation with a central thrombus. Only eight weeks after surgery, the boy could bear his full weight on his foot and the local pain as well the swelling were significantly reduced. (Fig. 5) At the one year follow-up the boy had returned to sporting activity. No signs of local recurrence were evident. Figure 5 Clinical control six months after surgery. The presented case describes a high-flow arteriovenous malformation of the foot. This localization appears to be rare with only few reports in literature. Whereas a third of vascular tumors (e.g. haemangioma) are visible at birth, the remaining 70% appears in the first years of childhood. They are characterized by a rapid growth in the first years but can also spontaneously become involuted. In contrast, congenital malformations increase in size as the child grows. According to their pathophysiology and vascular architecture low flow and high flow malformations are distinguished. Low flow lesions comprise capillary, lymphatic and venous malformations. High flow arteriovenous malformations are characterized by a high blood flow in a direct connection between arteries and veins without capillaries. The Schobinger staging system of arteriovenous malformations includes four grades of severity: dormancy, expansion, destruction and decompensation. Clinical manifestation may occur during adolescence and due to various stimuli (e.g. trauma, hormonal changes). In the presented case, the cause of expansion and clinical manifestation could not be determined. Depending on the localization, arteriovenous malformations present with different symptoms: local pain, swelling, skin ulceration, length discrepancy of extremities or severe bleeding with neurological complications. [13,15,16] After clinical examination further diagnostic investigations are recommended. Useful non-invasive methods to define the extent of the lesion are ultrasonography and duplexsonography. Additional non-invasive imaging modalities are magnetic resonance imaging and MR angiography including dynamic sequences with high temporal resolution. Transarterial catheter angiography is required in order to visualize the architecture of the vascular malformation and the arterial supply and venous drainage of the surrounding structures prior to treatment. [7,17,18,19,20] Depending to the extension of the malformation and the associated involvement of surrounding tissue, minimally invasive interventions or surgical resection may be necessary. 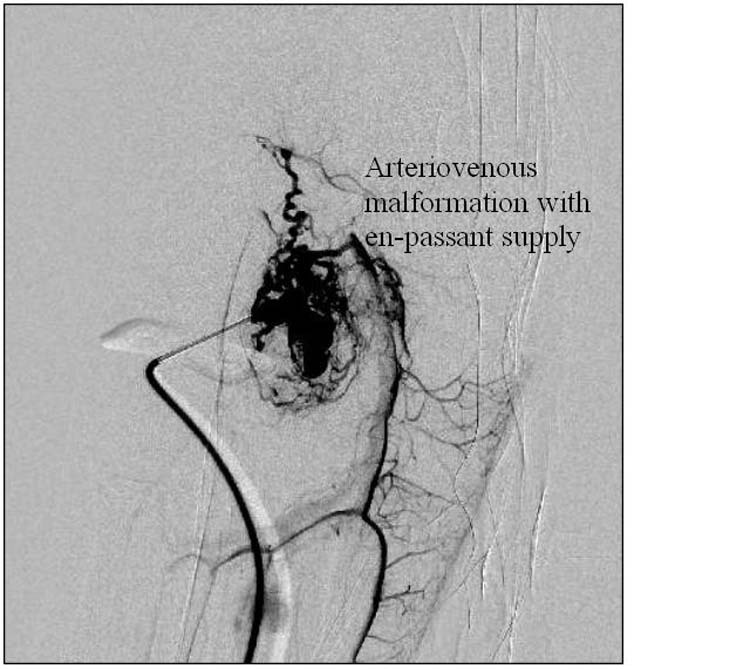 This report describes an unusual localization of an arteriovenous malformation. Nevertheless, the possibility of its existence should be considered in cases with the symptoms presented here. To facilitate rapidly diagnosis and to avoid unnecessary treatment, interdisciplinary therapy is recommended. 1. Mulliken JB, Glowacki J: Hemangiomas and vascular malformations in infants and children: a classification based on endothelial characteristics. Plast ReconstrSurg (69): 412 – 422, 1982. Fehl- und Neubildungen. Hautarzt (48): 622 – 628, 1997. 3. Willenberg T, Baumgartner I: Vascular birthmarks. Vasa 37(1): 5 – 17, 2008.
malformations (new issues). Adv Dermatol (13): 375 – 423, 1997.
diagnostische Radiologie 2. Springer Berlin Heidelberg. Color Atlas of Vascular Tumors and Vascular Malformations. 2007. 7. Ernemann U, Hoffmann J, Breuninger H, Reinert S, Skalejet M: Interdisziplinäres Konzept zur Diagnostik und Therapie gefäßreicher Fehlbildungen im Gesichts- und Halsbereich. Mund Kiefer Geschtschir (6): 402 – 409, 2002. (43): 958 – 966, 2003.
mature infants. Acta Paediatrica Scandinavica. 1955; 44: 370, 1955. In Schwartz RA, Lin, RL, Wei, TJ: Arterial vascular malformations including hemangiomas and lymphangiomas. eMedicine Pediatrics, 2006. Surg 18 (6): 894 – 900, 1983. 11. Enjolras O, Logeart I, Gelbert F: Arteriovenous malformations: a study of 200 cases. Ann Dermatol Venerol. 127 (1): 17 – 22, 2000. 12. Revencu N, Boon LM, Mulliken JB: Parkes Weber syndrome, vein of Galen aneurysmal malformation, and other fast-flow vascular anomalies are caused by RASA1 mutations. Hum Mutat 29(7): 959 – 965, 2008. Möglichkeiten bei peripheren Angiodysplasien. Helv Chir Acta. 38 (3): 213 – 220, 1971.
the growth of limbs: a review. J Pediatr Orthop B 13(6): 349 – 357, 2004. 16. Enjolras O, Deffrennes D, Borsik M, Diner P, Laurian C: Les tumeurs vasculaires et les regles de laprise en charge chirurgicale. Ann Chir Plast Esthet 43 (4): 455 – 489, 1998.
vascular birthmarks. Pediatr Dermatol 10(4): 11 – 313, 1993.
peripheral vascular malformations. AJR 181: 729 – 735, 2003.
multidisciplinary clinic. AJR 174: 597 – 608, 2000. 20. Watanabe Y, Dohke M, Okumura A: Dynamic subtraction contrast-enhanced MR angiography: technique, clinical applications, and pitfalls. Radiograph 20(1): 135 – 152, 2000. Tel.+ 49 7071 2986685,Fax + 49 7071 294091. 1 Department of Orthopaedics, University of Tuebingen Hoppe-Seyler-Str. 3, 72076 Tübingen, Germany. 2 Department of Neuroradiology, University of Tuebingen Hoppe-Seyler-Str. 3, 72076 Tübingen, Germany. 3 Department of Radiology, University of Tuebingen Hoppe-Seyler-Str. 3, 72076 Tübingen, Germany. This entry was posted in Uncategorized and tagged angiography, arterovenous malformation, children, Foot. Bookmark the permalink.